What could be more enjoyable than curling up with a cozy mystery on a cold fall night? 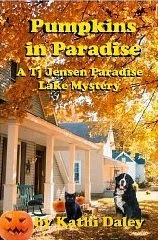 Pumpkins in Paradise by Kathi Daley is the first of the Tj Jensen Paradise Lake Mysteries. The first book in the series revolves around the death of Tj's dear friend, Zachary Collins. While the death is considered suicide, Tj knows better than that - or does she? Turns out Tj doesn't know as much about her friend as she thought she did. From the very first page, I knew I was going to love this book. 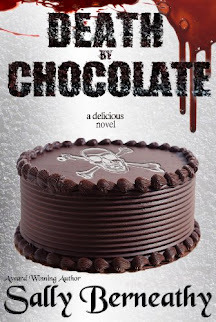 The main character is extremely likeable and the story is well-written. While many mysteries are easy to figure out, Pumpkins in Paradise kept me guessing until the very end, though I was able to guess some of the side mysteries in the story. Pumpkins in Paradise by Kathi Daley is a wonderful read for those that want a Halloween novel that isn't loaded down with gore and spine chilling tales. I recommend this book to anyone looking for a great mystery. It's filled with loveable characters, animals, and the beginning of what could bloom into a beautiful romance.